Tech Deck have a reputation as the number one name when it comes to producing finger skateboards/mountain bikes and accessories. The company are also responsible for putting out a number of Tony Hawkes toys, including a remote control version of the king of skateboarding. The company's new Tech Deck Dude range follows on from the Tony Hawkes radio control toy by substituting the king of cool with two very strange characters called Lenny (pictured above) and Nick - neither of which seem to resemble anything seen outside of a very bad nightmare. The kits come complete with a jump ramp, four extra wheels and four cones. It might be because I am getting on a bit, but I really couldn't get into playing with this. The controls were easy to use, but I found it difficult to get the skateboard to do anything that I really wanted it to. The asking price of £25 seems a little on the expensive side, knock a tenner off and you'd be closer to a reasonable purchase. 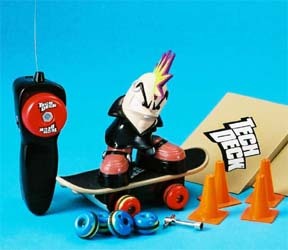 I was also wondering whether Tech Deck's contract had expired with Tony Hawkes and that was why these hastily designed replacements are now entering the market.